The Eiffel Tower is one of the most popular sightseeing destinations in Paris. Queues to go up can be long making it sensible to buy elevator tickets online in advance. Annually around 7 million visitors go up the Tour Eiffel in Paris. This is around 20,000 visitors per day making it very sensible to buy tickets in advance to skip queues. Tickets are available online allowing visitors to reserve a specific date and time to go up the Eiffel Tower. Prices for online tickets are the same as when bought in person at the foot of the tower. A cheaper alternative is to take the stairs – tickets not sold in advance. If no tickets are available, some bus tours of Paris also include a ride up the Eiffel Tower. Reservations at the expensive Le Jules Verne Restaurant include the elevator ride. Tickets for the elevators / lifts of the Eiffel Tower in Paris can be bought in advance and online. The prices are the same as buying the tickets at the tower itself but of course ensure admission without long queues. Tickets to Level 2, which include access to level 1. Tickets to Level 3, which is near the top (“sommet”) and requires an elevator change at level 2 and include access to level 1. Most visitors find the views from level 2 (115 m) totally acceptable with level 3 (276 m) too high to really enjoy the Eiffel Tower views of Paris. Also, the elevator to level 3 is a bit cramped and further queuing is often required at the elevator change on the second level. Advance elevator tickets can be bought online for the Eiffel Tower. The process is fairly simple and prices the same as for tickets bought in Paris. Tickets can be printed at home, loaded onto smart phones, or mailed (for a charge). The ticket, and not only reservation number, must be presented at the tower entrance within the stated time window. Buying the ticket is straight forward enough and possible in several languages. When choosing a ticket, note that the default is for the more expensive ticket to the top, most visitors only go to the second level (“Lift entrance ticket”). The system shows the next date that tickets are available – input the desired date here – in the second step it is possible to scroll through the calendar a few months ahead to show on which dates tickets are available and then the times on the given day. 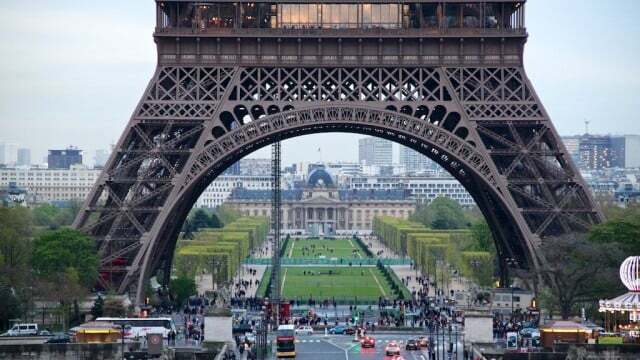 Currently Eiffel Tower tickets prices for level 2 (level 3) are for adults €16 (€25), youths 12 to 24 years €8 (€12.50), and children 4 to 11 years €4 (€6.30). Children under 4 years are free but do include them when buying tickets. Handicap persons including wheelchair users and one assistant each pay the child fares – access to level 1 and 2 only. The main disadvantage of buying tickets online is that the purchase if final. If traveling plans change or the weather is bad, there will be no refunds or changes allowed. However, the advance purchase tickets remain the cheapest options. During busy holiday periods and weekends advance purchased online tickets for the Eiffel Tower often sells out fast. 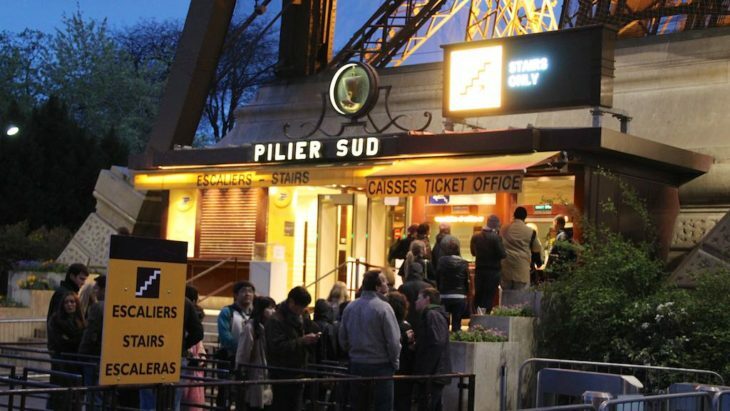 However, there are several other options to go up the Eiffel Tower when online tickets are no longer available. On some instances where the first available date on the tower’s own website is weeks away, some other (more expensive) options may have tickets available within days. Tickets are always sold at the tower itself – even on days and at times that shows no availability online. Of course, the length of the queues varies and being in the queue does not guarantee admission. Eiffel Tower stairs access tickets are not sold online, except as part of a guided tour, but the queues to start the 704 steps to level 2 are generally short or nonexistent. It is the cheapest way to level 1 and 2. Stairs access is €10 for adults, €5 for youths and €2.50 for children. Stairs usually close at around 6:30 pm (midnight during high summer). Join a sightseeing bus tour of Paris or similar – see Get Your Guide for some options. Some of these day or half-day tours include group access to the Eiffel Tower as part of the package. The cheapest option, still at around double the normal price, is a simple guided tour with the guide accompanying the group simply to the second floor – tours adding a cruise or other sights may actually be better value. Similarly, lunch at Restaurant 58 on the first level is only marginally more expensive than just the Eiffel Tower tour. Behind the scenes guided tours of the Eiffel Tower are also available but reservations may be even more difficult than buying elevator-only tickets. They are a great way to learn more about the tower and it structure. The Paris Museum Pass is a great savings deal when visiting Paris and Versailles but is NOT valid for Eiffel Tower access.